Located on eleven acres in East Norriton Township, the beautifully landscaped grounds of the Parish have four buildings ~~ The church, the rectory/meeting room, a regional elementary school, and the offices for Catholic Social Services for Montgomery County. A large field for sporting ventures occupies the Northern end of the property. Parking for two hundred cars is available on the grounds. 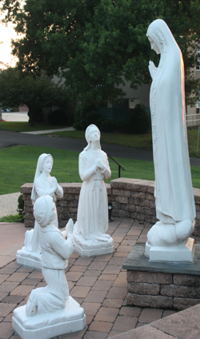 An outdoor shrine to Our Lady of Fatima is prominently located on the center of the property, directly opposite the front doors of the church. Lighted at night, the shrine can be seen from the roadways that border the Parish grounds. This shrine commemorates the parish’s devotion to Our Lady of the Rosary of Fatima, in whose honor a large candlelight procession is held every October. 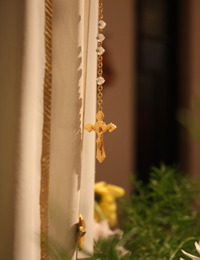 The Fatima shrine was erected and blessed on the occasion of the tenth annual procession, in October of 2005.